Here’s a photo taken by Erik as we were waiting for the slipway to be ready to haul us out about a month ago. On board are Phil from Dragon Song and Claude the Torqeedo man for those tests. In the foreground is Erik’s beautiful junk rigged dory, Isabella. Check out the sleek timber foremast – unstayed to suit the junk rig. 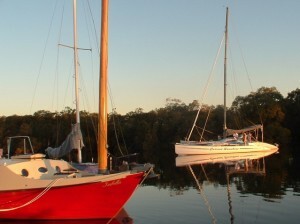 Erik took her out just a few days ago for her first sail and she enjoyed frolicking in Deception Bay. She’s the same design as Badger that featured in Annie Hill’s Voyaging on a Small Income. Yet another incident has befallen me – to again keep me at Monty’s boatyard. But before I get to that, let me tell you the good news. The Torqeedo is performing even better than before! Last Friday Current Sunshine went back into the water and we motored her not far to tie up at the jetty. But far enough to be impressed by the power of the motor now that the bottom opening in the well has been reduced, and flaps added to streamline the hull where the motor pokes through. On board were Steve and Erik. Steve has been on board for previous Torqeedo tests, and both he and I were really surprised about how much grunt it has now. We suspect it is due to the added streamlining. Although there’s also two other adjustments that maybe we got right, and have helped to give this extra thrust. The angle of the motor leg was trimmed so that the thrust is exactly parallel with the water, and the depth of the prop lowered just little from earlier tests to the minimum recommended clearance of 50mm (2 inches). All told it has worked well. Right now the batteries are recharging from another discharge test I did while on the slip. In a few days they’ll be charged again and we can do another speed test. While on the slip I did two discharge tests. In the first one the low voltage alarm triggered at 155 amphours. An improvement on the earlier 140 amphours, but still low. So I charged them again, and then did another full discharge test. This time the discharge got to 175 amphours and still going. But I had to stop the test because she was about to go back in the water that evening, and so I had to put them back on charge. If I had continued the test its possible that they could have reached the expected 200 ah this time. When I terminated the test the voltage was still good. One of the projects I did on the slip was to upgrade the fixing of the bobstay to the stem. This required a new stainless steel fitting for the bow, and which Mark’s Arcs fabricated for me. But when on Friday morning I began attaching it, the drilling of the fixing holes revealed damp and weakened timber. It will have to be repaired. What’s not clear is the extent of water ingress and weakening of the timber. That will need some time back on the cradle again to investigate the extent of the problem and figure out how to repair it. So cruising plans are on hold yet again. And maybe I didn’t get it after all. I need to ponder again on the esoteric meaning of this latest setback.